Reading is one of the most important things you can do with your child. It teaches them vocabulary, inspires imagination and is the best time to cuddle! I started reading to my DS6 around 6 months of age. Knowing that he didn’t really understand what I was saying, didn’t stop my nightly ritual. I read books that rhymed, that were simple and had colorful pictures. When my DS4 and DD1 were born, story time was such a ritual in our house with DS6, that it felt right to incorporate them right away. Story time in our house is a quiet event, where each child chooses a story of their liking and we cuddle on Mommy and Daddy’s bed and read the books. Sometimes we discuss them, sometimes its the same book 3 days in a row, and sometimes it is French! DS6 is now in grade 1 and is learning how to read. 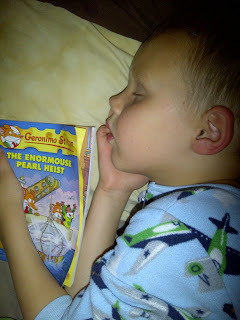 I wanted to encourage this new found talent in our story time ritual but often got discouraged when he refused to read. He’d pretend that he didn’t know the word when I know he read it yesterday. He would guess the word based on the first letter, instead of taking the time to sound out the world or just be stubborn and refuse to read. Instead of taking this with frustration, I took it as a challenge. I knew if I found the right book, I would be able to a) keep his interest, b) encourage him to read, and c) keep his siblings entertained as well. The search began on the internet. I found a lot of good options but they didn’t feel quite right. I searched a local book store and again I didn’t find what I was looking for. Then one day after work, I was in Shoppers Drug Mart (of all places) and decided to browse the book area. I saw the traditional board books, storybooks, and chapter books, then I came a cross a hybrid book a cross between a story book and chapter book; Geronimo Stilton. This is a series that follows a mouse novelist, Geronimo, who writes about many adventures he encounters and the friends he meets. 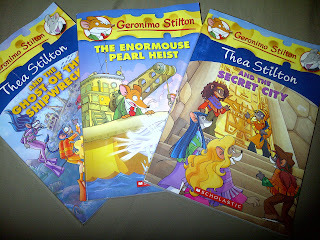 There are over 50 books in this series and its has become so popular that characters from the book, such as Thea Stilton and Creapella Von Cracklefur, have branched off into a mini series of their own. This book is geared for children aged 6-12 years old and was first published in Italy in 2000. Since then, these books have been published in 35 different languages and sold all over the world (Wikipedia). 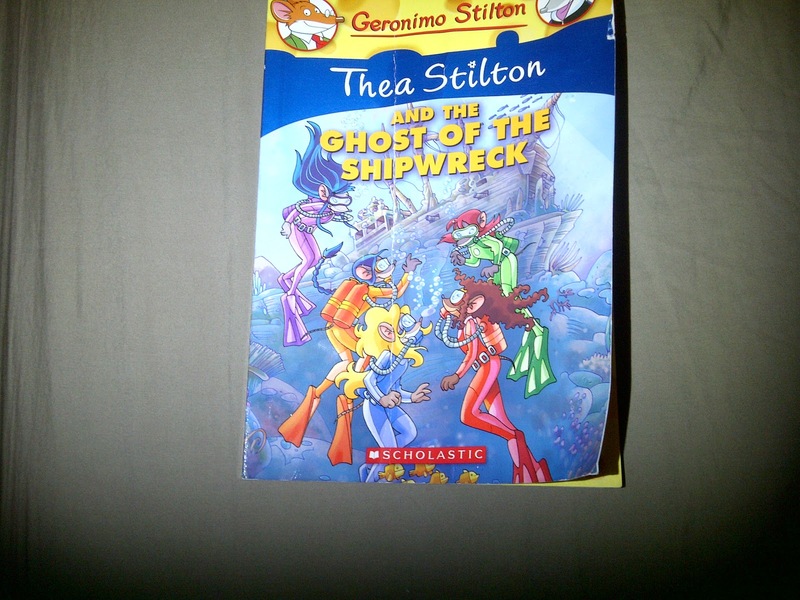 The book that my children and I are reviewing is Thea Stilton and the ghost of the shipwreck. 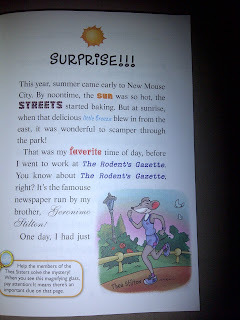 This book is about Thea Stilton, Geronimo Stilton’s cousin, a special correspondent for the Rodent’s Gazette. She follows the adventure of a group of 5 mouslings, the Thea Sisters, from Mouseford Academy who always stumble on one adventure after another. 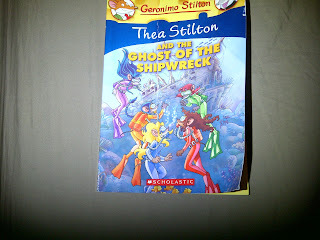 In this book, the Thea sisters search for their missing biology teacher on Whale Island. Their search leads them to an old sunk ship with a ghost and a missing treasure. Upon the ship they find their biology professor, evil treasure hunter’s and the ‘fabumouse’ Jasmine’s diamond. When they think their adventure is over, a friend invites them to China to uncover the mystery of the historic Princess Jade gem. I was very impressed with this novel. There were many aspects that I liked. I liked that the book was divided into chapters. With reading only a few chapters a night, it taught the boys that art of suspense and it had the hypothesizing what would happen next. I liked that every chapter included a magnifying glass picture on random pages so that the reader could be part of the story too. The magnifying glass signified when an important clue was discovered that would help the reader solve the mystery. 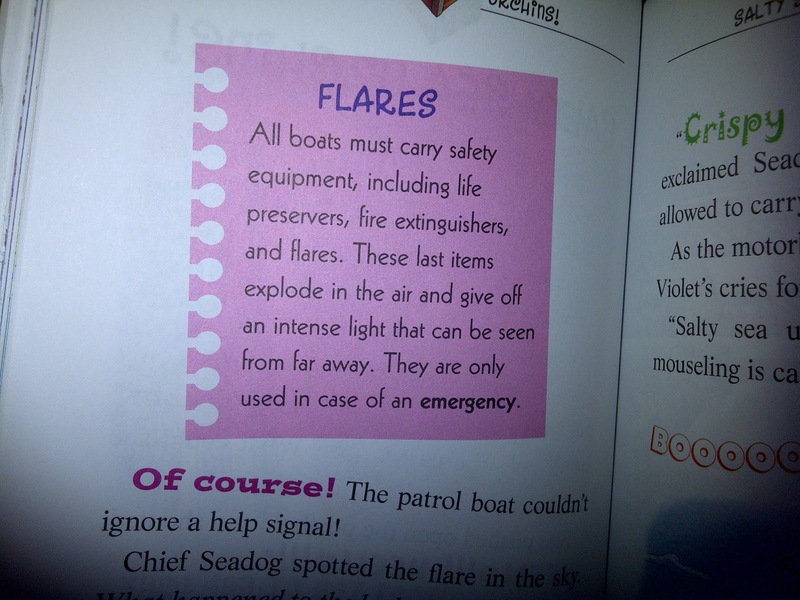 Another feature that was unique, was the information pages. Every time the book came across a complex topic, there would be a side bar that would describe it in detail. For example, the Thea sisters came across a repeating signal on their professors computer that consisted of dot dot dot, line line line, dot dot dot (i.e. Morse code). The side bar explained what Morse code was and showed how each letter of the alphabet was represented by the lines and dots. The part about the book that I liked best was the way it was written. The author chose to highlight words in a different color and font periodically throughout the novel. When I saw this, I was inspired right away. 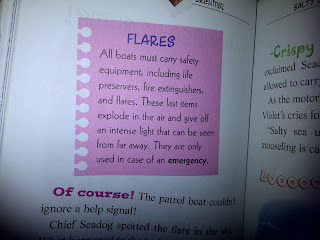 What a good way to encourage DS6 to read while not overwhelming him with a large amount of text. At first he was hesitant. 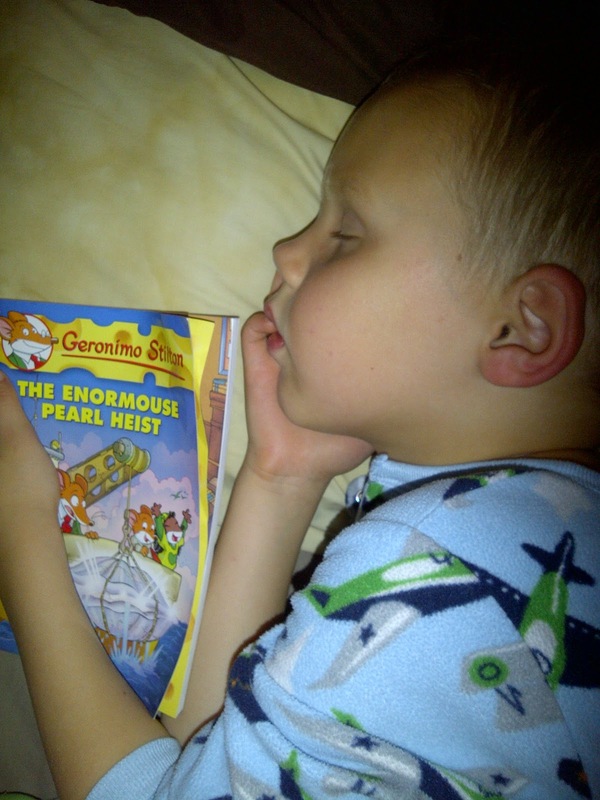 Another ploy Mom was coming up with to get him to read. But the more we read, the more involved he got. He liked his ‘special’ words and I found him following along the story (and catching me if I missed a word) more then he did before. I would highly recommend this novel to anyone who has a child who is getting bored of story books and looking for a more in depth plot line. It is a treasure that my family enjoys night after night! Thanks for the review. I’d seen Geronimo’s tales lately while online and saw that he has a fantasy series that my 8 year old would love. I hadn’t heard of it before, but now that I can see it, I think it will be on the Christmas list! Thanks!